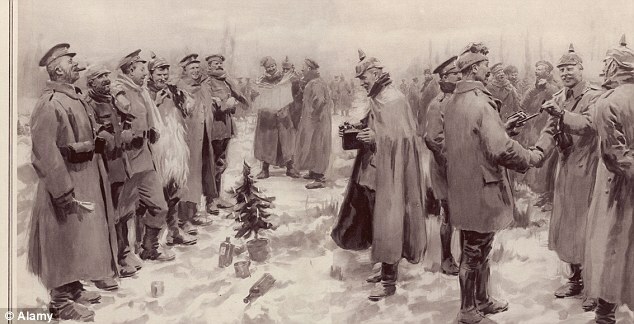 Sergeant Alfred Anderson is believed to have been the last survivor of the Christmas Truce. He was aged 18 on 24 December 1914 and serving as a private in the Black Watch on the Western Front. Some 90 years later he recalled the moment when the German troops began singing Silent Night from their trenches: ‘I remember the silence, the eerie sound of silence. Only the guards were on duty. We all went outside the farm buildings and just stood listening. And, of course, thinking of people back home. ‘All I’d heard for two months in the trenches was the hissing, cracking and whining of bullets in flight, machine-gun fire and distant German voices. This entry was posted in Events and tagged Belgium, Black Watch Highlanders, Christmas Truce 1914, France, peace, Western Front. Bookmark the permalink.